Sunday started off with a lazy brunch on Carroll Gardens. I assumed it would end lazily with a movie or reading a book. But that’s the great thing about New York, no matter where you think the day might take you (even a Sunday), it can be unpredictable. Post-brunch found me riding in the back of a rented Mini Cooper as my friend navigated up the West Side Highway to the Cloisters. As we hit midtown, it began to rain. By the time we made it up to Fort Tryon, the rain turned into a light drizzle. We had an hour and 15 minutes before the Cloisters closed for the day. During that time, we navigated through the stonewalled rooms, feasting our eyes on gold chalices, unicorned tapestries and inhaling the scent of rain-soaked medicinal, medieval herbs in the garden courtyard. It was the first time I didn’t stop to read every placard of information. I knew and didn’t know what I was looking at, but sometimes imagining an item’s place in history, in battles won or lost, religious services presided over, mouths that have drunk the “Body of Christ,” is more fun than finding out the hard facts. It’s quite freeing to spend the time looking at things rather than reading. 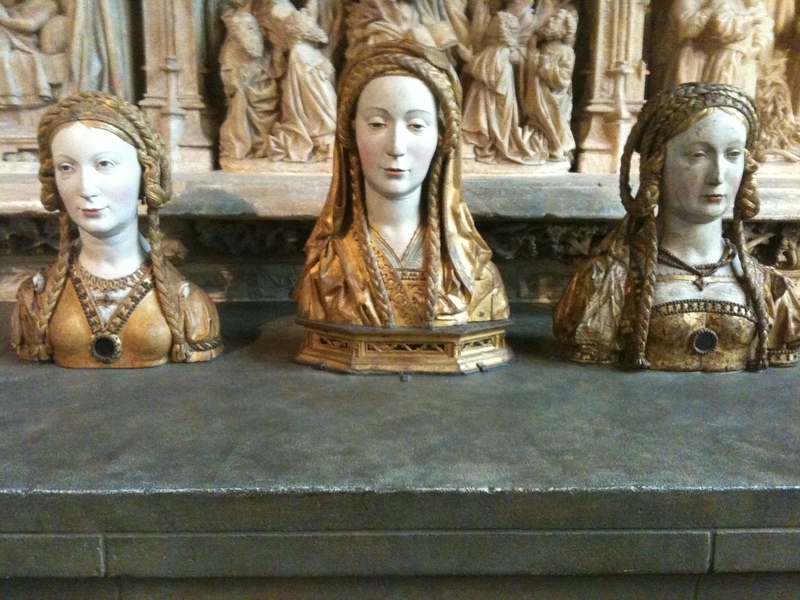 Of all the religious artifacts we took in at the Cloisters, these busts on an altar struck me as the most interesting. Very few religious sculptures, tapestries, paintings and stained glass windows bear faces with any expression other than a blank, but holy (perhaps holier than thou) look. I wonder why the artist chose to be so specific. Was it because the models were real and full of personality? Did he know them too intimately to completely disconnect from the person vs. the art? The lazy Sunday version of myself chose not to read the placard and make a note to go home and Google the artwork. I simply let my mind wander outside of the cloistered walls and came up with a million scenarios. Mentally, I was as far away from New York as one could get. But that’s the beauty of New York, wherever you go in the city can feel miles away from where you actually are. New York is a tapestry of worlds cloistered onto a small island. Even on a Sunday, you can never really be lazy in New York.